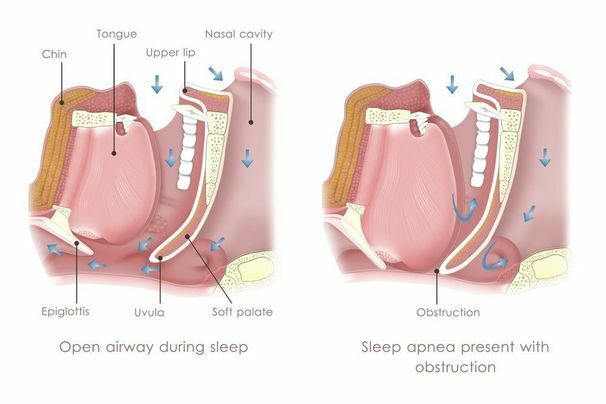 Sleep apnea — a condition that causes breathing to become repeatedly interrupted during the night — currently affects more than 18 million American adults. When left untreated, sleep apnea can greatly diminish a patient's quality of life and lead to a range of concerns. In order to help protect the overall health of his patients, Dr. Jon Marc Van Slate performs thorough diagnoses and provides non-surgical sleep apnea treatment at his Houston, TX, practice. To discuss your symptoms with Dr. Van Slate, schedule a sleep apnea consultation today. There are two forms of sleep apnea: obstructive sleep apnea (OSA) and central sleep apnea (CSA). OSA occurs when throat muscles relax and block airways, and it is the most common form. Conversely, CSA occurs when the brain does not send proper breathing signals, and it requires treatment from a specialist. Patients who suffer from OSA often experience chronic fatigue, difficulty concentrating, morning headaches, and other concerns. If you have noticed any of these symptoms — or if your partner has reported that you snore loudly or awaken abruptly during the night — Dr. Van Slate will first discuss your sleep habits during an initial consultation. In order to perform an accurate diagnosis, we will have you undergo a sleep study with the ApneaLink™ or MediByte® Jr. screening device. Worn while you sleep, the ApneaLink™ or MediByte® Jr. device will record breathing patterns and other valuable data. Dr. Van Slate will review the results of your sleep study to determine if you suffer from OSA. When you wear your oral appliance, it will help to keep airways open so that you can get a full night's sleep. Dr. Van Slate can often effectively address symptoms of OSA with a custom oral appliance. After taking detailed impressions of your smile, we will use the advanced K7 Evaluation System to measure different neuromuscular functions and the strength of your bite. This information will then be used to create a custom oral appliance. We choose to feature MicrO2™ sleep devices because they are highly effective, comfortable to wear, and easy to adjust. When you wear your oral appliance, it will help to keep airways open so that you can get a full night's sleep. After beginning treatment, you will eventually undergo a second sleep study so that Dr. Van Slate can evaluate your progress. The ApneaLink™ or MediByte® Jr. and MicrO2™ oral appliance can be comfortably worn together during this second sleep study. Dr. Van Slate will compare the new data with the results of your first sleep study to determine if your oral appliance has been effective. Based on the findings, he will make any adjustments, if necessary. If we find that you are not responding to treatment, we can refer you to a sleep apnea specialist in the area. Dr. Van Slate and his team are committed to providing patients with comprehensive services of the highest quality, from routine cleanings and examinations to treatment for sleep apnea. To schedule a sleep apnea consultation, reach out to our practice today.